The instrument can sensitively capture fine images through the unique digital optical system. Equipped with the magnifications of 4X, 10X, 40X and 100X (4 steps of zoom objective lenses), high resolution sensitive chip, pure metal housing and support, frosted lamp and adjustable aperture diaphragm, the instrument is capable of converting the simulated optical image data captured by the optical microscope into digital optical image data through the digital video camera and displaying the microscopic image through the display. The dynamic sight window makes it possible for you to instantly capture the image and easily master the overall appearance. Through the system, we can realize the function of data storage, analysis and printing. The system can be applied in biomedicine, teaching and education, family medicine, electronic industry, academy, research institutions, ore industry, metallurgy industry and desktop printing. It has two advantages. 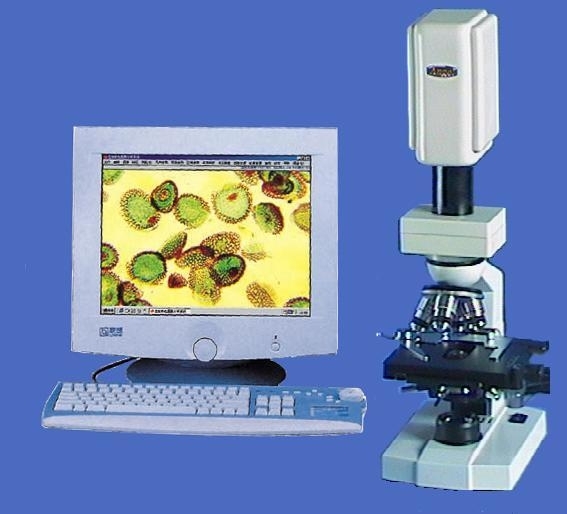 One is that all of the results can be displayed in the monitor of the computer and therefore the images can be clearly observed not only by the user of the microscope but also other persons stand beside the user, which provides convenience for the scientific research, education, measurement and analysis. Another is that the photographing device of the system can be easily operated and controlled and the image can be captured without difficulty, which brings more convenience to the users than the traditional microscopes. Being used in the Education Literature System, the video microscope enables the students learning at different locations to observe the same image at the same time. This is especially important for the teachers and students of medical science. At the same time, the system makes it possible for the doctors to study the situation of disease through the lantern slides of the digital microstructure of specimen transmitted by the internet instead of the traditional slide glasses, which speeds up the diagnosis of disease and helps the clinical doctors to get together through the internet all of the experts from worldwide to attend the real-time consultation so that to find solutions for the difficult and complex disease more quickly. The instrument becomes especially helpful for those doctors who work in the rural areas and countries when they want to get information and help from the experts of the teleconsultation center. 1. Save your eyes from the fatigue caused by optical lens. 2. 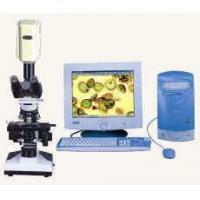 Make analysis for and comparison between different microscopic Images.3. 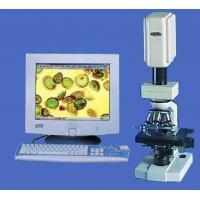 The instrument can save the microscopic results and exchange information between different devices. 4 The instrument is capable of printing the microscopic results. 5. The instrument can speed up the automation of inspection.6. The instrument can also be used as a common microscope. High resolution digital CCD is installed inside. Static digital signal: 1,300,000 pixel. Angel Precision Instrument Co., Ltd.is a high-tech enterprise integrating the production of teaching instruments, medical instruments, industrial inspection instruments, as well as scientific research & development, manufacturing and sales. Angle has excellent talents of high technology field, and carries out good cooperation with scientific and research institutes such as Jiangsu University, Jiangsu Technology University, etc., so as to establish strong team of scientific research and constantly develops various kinds of instruments to meet the market demands. The General Manager Mr. AI, is the domestic chief expert in microscope technology for operation. By overcoming many difficulties, he has successfully designed the China first surgery microscope for brain nerves and microscope for Otolaryngology Department, and initiated the zoom optical chain microscope system and binocular operating microscope system for teaching. All these achievements have made China the third country to master core technology of brain nerve surgery operating microscope besides Germany and Japan, thus making great contributions for the development of brain and Otolaryngology Microscopic Surgery in China. In year 1990, Mr. AI is awarded as Young Expert with Outstanding Achievements” by National Mechanical and Electric Ministry. Aimed to serve whole-heartedly for the development of educational business and bring more convenience to your work and motivated by the ceaseless pursuance of perfection, we have developed the microscope series based on the application of the latest science-technology achievements and the perfect integration of the classical manufacturing techniques of machinery, electronics, computer and optical instruments, namely, the Multimedia Display Stand for Education, Video Display Stand, Real-object Display Stand, Color Television Microscope, Digital Biomicroscope, MDI One Drop of Blood Detector, Sub-health Detector, Brinell microscope, One Drop of Blood Microcirculation Detector, MDI Ultramicroscope, Multi-function Phase Contrast Video Microscope, Digital Phase Contrast Microscope, Black Background Microscope, Dark Field One Drop of Blood Detector (Black Background), Digital Electronic Colposcope,Sperm Microanalyzer,Computer Assisted Sperm Analysis, Microanalysis System for Sexually Transmitted Disease, Industrial Microscope, Industrial Detection Microscope, Video Metallurgical Microscope and Educational Operating Microscope, which have been widely used in many fields such as education, medical treatment, conference, public security organs, procuratorial organs and people's courts, industry and commerce etc. In addition, our company has launched into the market the Multi-media Electronic Classroom, Micro-interactive Classroom System, Multi-media Video Conference System, Live Broadcasting System for Video Conference, Multi-media Intelligent Trial System, Video Educational Operating Microscope, Color Video Endoscope, series work stations for medical imaging and graphics and Multi-media Medical Consultation System. Our products have won the gold medals awarded by the Chinese National Patent Exposition for many times. We have been sticking to the principle of Quality as the Base and Service First. For so many years, our teaching, medical and industrial inspection instruments are highly welcomed by vast users by its high quality, preferential price and excellent services. We will continue to introduce world advanced technology to provide you with ever-improving products and excellent services.